Today's Activities:Upon arrival at Lhasa Airport, you’ll be greeted & warmly welcomed by our professional English speaking tour guide. Transfer to the hotel which you booked before. Today's Activities:Today you will go to visit Norbulingka . Norbulingka, which means "Jeweled Garden", was constructed as a summer palace for the Dalai Lama and later served the whole governmental administration. Then we visit Drepung Monastery . Drepung Monastery used to be the living palace of Dalai Lamas before the reconstruction of Potala palace (after the 5th Dalai Lamas was bestowed by Qing emperor Qianlong). After lunch you will visit Sera Monastery . 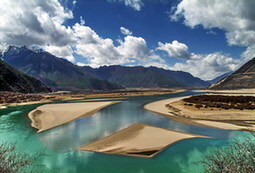 It is known as one of the three greatest monasteries of Tibet. 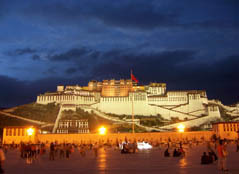 As one of the three main monasteries of Lhasa, it is here that the monks "famous daily debates" take place. Then we will go to The Carpet Factory. One of the most famous souvenir in Tibet is carpet. By visiting the Factory you will have a general idea how carpets are produced. Today's Activities:After breakfast our guide will transfer you to Yambajan and Lake Namtso . Yambajan is famous for its hot spring and is a nice choice for those who want to get a close look at the Tibetan herders (drokpa) and their semi-nomadic lifestyle. 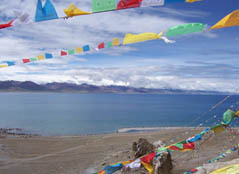 Lake Namtso is the second largest saltwater lake in China. The lake is extremely beautiful with its azure water and surrounding snow capped peaks.